It seems the level of corruption at the hands of politicians and power hungry investors is no different in Canada than anywhere else in the world. Environment Canada has approved the commercial production of GM Atlantic salmon eggs which grow to market-size twice as fast as other farmed salmon. 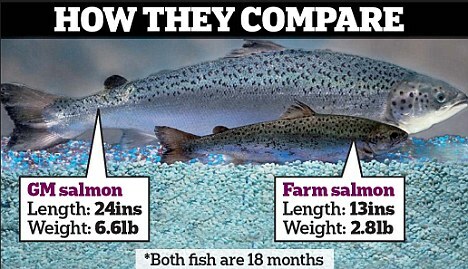 The biotech company responsible, Aquabounty, has revealed that it is no longer asking for approval to grow the fish in the US but plans to produce all of the GM salmon eggs in Canada and then sell “table-ready” GM salmon into the US consumer market. It is an alarming decision that sets Canada up to be the source of global environmental risk, says the Canadian Biotechnology Action Network. A U.S. company who has lobbied to commercially produce genetically modified salmon eggs in Canada says it has cleared a major hurdle in its proposal to make the fish available for human consumption, a possibility that has critics worried about the prospect of “frankenfish” escaping and endangering wild Atlantic salmon around the world. The Environment Canada approval is the first government approval for the company AquaBounty. The company has asked for approval of the GM Atlantic salmon for human consumption in the U.S., based on a plan to produce the GM fish eggs in Prince Edward Island (PEI), Canada and ship them to Panama for grow-out and processing. Environment Canada’s conclusion is that the eggs are not harmful to the environment or human health when produced in contained facilities. “This is a concrete environmental risk now that’s coming directly from Canada,” Sharratt said. She said Ottawa’s decision is a surprise given that federal officials hadn’t indicated publicly that a review was underway. In an email, Environment Canada said the decision was made by departmental scientists “based on a thorough scientific evaluation of the latest evidence and studies.” The department also said that the federal government has effective regulations in place to protect the environment and human health from potentially adverse effects of genetically engineered organisms in Canada. Stotish said Aquabounty’s proposal was subject to a risk assessment conducted by Fisheries and Oceans Canada involving a panel of independent experts in transgenics and fish containment technology. Aquabounty’s plans have drawn opposition from some state lawmakers in the U.S. as well including Alaska, and from environmental groups who fear that the genetically modified fish could escape their onshore farms and put wild populations at risk. In February, the public response was so strong that the U.S. Food and Drug Administration announced it was extending its comments period on its preliminary assessments of the fish, which found they posed no significant environmental impact. “This isn’t the international image we want for our beautiful Island,” said Broderick. Just last week, on November 21, an environmental group in Panama filed a complaint alleging that AquaBounty’s research and development of the GM fish, using eggs sent from PEI, was not in compliance with national and international environmental regulations. AquaBounty is headquartered in the U.S. but the GM salmon is based on a gene construct patented by two Canadian university professors. The company also has research facilities in Prince Edward Island where it grows GM fish for experimentation and testing. The company recently revealed that it is not actually asking for approval to grow the fish in the US but plans to produce all of the GM salmon eggs on PEI, ship the eggs to Panama for growing out and processing, and then sell “table-ready” GM salmon into the US consumer market. Just two years ago a Purdue University scientist urged federal officials to decide favorably on allowing genetically engineered salmon into the food supply arguing that not doing so may set back scientific efforts to increase food production. The argument came in direct contradiction to statements made by the same scientist who found that releasing a transgenic fish to the wild could damage native populations even to the point of extinction. The aquaculture industry does not support the commercialization of GM fish and has stated that there is no market demand. Across North America, grocery stores are now pledging not to use GM seafood. The first GM Food Animal in the World? The GM fish was in a race with the GM pig called “Enviropig” to become the first genetically engineered animal in our food system but the campaign led by the Canadian Biotechnology stopped the GM pig in March 2012, making GM salmon the first commercially available animal for human consumption. Critics have long warned that the process of genetic engineering itself could possibly result in increased allergenicity and AquaBounty’s own data point to this potential in their GM salmon. Dr. Michael Hansen, Senior Scientist at Consumers Union US, says, “The FDA is relying on woefully inadequate data. There is sloppy science, small sample sizes, and questionable practices.” For example, the company used insensitive tests to try and measure the levels of growth hormone in the GM salmon and the levels of IGF-1, a hormone linked to a number of cancers.